Dukes' free customer car park is immediately in front of Dukes' main entrance. All adjacent parking is free at weekends. Dukes 92 is approximately 100 metres along Castle Street. Castle Street is located at the southern end of Deansgate opposite Deansgate Station (at the junction of Deansgate and Whitworth Street). Dukes 92 was originally a stable block for the horses delivering foods off barges to the Merchants warehouse opposite. From these humble begininngs the building now houses Manchester's original bar and grill which has been refurbished and extended three times since its opening in 1991 the space today is informal and airy with the buildings heritage being reflected in a subtle blend of antique furniture and modern fixed seating. With its most recent refurbishment Dukes can now properly call itself a venue with two bars, three private events spaces, a grill restaurant, excellent smoking facilities, canalside terrace and balcony overlooking the canal basin. Dukes continued appeal relies on its ability to transform from a relaxed, family friendly environment by day to a vibrant and stylish bar and grill by night. The space has been extended and refurbished since its opening in 1991 and inside its interior combines contemporary features and its trademark antique furniture. Food was pretty decent for the price, but a lot of the menu options weren’t available. Also the service needs improving. You shouldn’t have to ask twice for the bill and stare at the menu for 20 minutes before getting to order. However, I would go again on the off chance someone with restaurant experience is working. We did have to return 2 of our meals, but the other 2 meals were excellent, the staff was very good considering how busy it was. Was extremely busy being bank holiday weekend but we had booked a table and were happily allowed in past the queues to our table. Service was good and efficient seeing as it was so busy. I would like to say the girl that served us was exceptional. We felt like an after thought for the waiters. We’re not particularly demanding or impatient but it was as if we didn’t exist. Almost ruined the whole night. It’s a shame coz the food and atmosphere had great potential. It was our anniversary and we were seated next to 4 very loud and obnoxious people. We ordered drinks which arrived after our starters did but what we have (the chicken wings) were amazing! We couldn’t fault them. Next our mains were the sirloin steak and a rib eye steak both medium rare which one arrived medium which made the steak somewhat dry. Following on from this we decided against having dessert due to the commotion still coming from the table next to us. We have been previously and it was fantastic and we couldn’t fault it but this time was different. I booked a table for a family meal, i ordered a beer and a water, despite asking 3 times the water never came. My son arrived a bit late and ordered his drink we had to ask twice for that. There was no attentiveness and we were not asked if we wanted anymore drinks at any point during our meal. The food is ok, very expensive for what it is. I would, but not on busy days. It's far too noizy, plus I don't think the service and quality of food is as good. My Sunday lunch was luke warm and was given wrong dssert , waited ages for drinks and bill took forever to come. We had a lovely Mothers Day meal. We arrived 50 minutes early but we were still able to be seated straight away. The service was prompt and though one of the orders was slightly wrong it was corrected straight away resulting in my mother receiving free mash potato!!! took my family here for mother’s day, we had a lovely time. food was great, service was amazing. i’d recommend this to anyone. The food and drinks were great as usual, the only issue was the service was a bit slow. However it was very busy because of Mother’s Day and we were having lots of fun catching up so it wasn’t really an issue and won’t stop us coming back again. Fantastic food. Brilliant atmosphere. Fantastic value for money. A nice bar restaurant but cold seated at a table near the door every time someone went in and out! The music was very loud making it difficult to have a nice lunchtime family conversation. Staff waiting were friendly and helpful and the food was good. We had an awful experience at Dukes 92. From a piece of glass in someone’s drink to a huge delay in getting main courses and finishing with a waiter with a bad attitude towards us (pulling faces behind our backs etc.). Spoke to the manager who apologised and offered to buy us a round of drinks but we were in a rush as they already knew. He said he would speak to the waiter involved and get back to me but we’re still waiting. I’ve seen a few reviews complaining about the service, where staff are standing around chatting or spending too much time at the bigger tables. You need to look after and respect all your customers if you expect return visitors. I have been here a few times and the food is lovely, we were sat a little earlier than The time We booked which was lovely. Food and service was quick and the food was lovely. Dukes 92 is a glitzy stylish bar and restaurant right by the canal, so perfect on bright sunny days for al fresco dining and drinks. When we visited it was unseasonably warm and sunny so outside was packed. We had booked a table for lunch and first impressions did not disappoint. However, service was incredibly slow - needed at least one extra person behind the bar as we waited 15 mins for our initial drinks. Staff were helpful, friendly and as efficient as they could be but the bar and kitchen were clearly struggling with the service. At times the wait was borderline unacceptable. Our waiter was lovely and friendly. The food was great! Will certainly be returning. There was some issues with the food; the wrong cheese was brought out for the starters. The steak for the main was cooked medium when I had asked for it to be cooked blue. One of the drinks took 20minutes to arrive. The waitress Jess was very accommodating and did everything she could to make mine and my partners anniversary enjoyable. Regardless of the mistakes made, they were not major and were dealt with immediately to accommodate our needs. The high quality of service made up for the mistakes made. I would visit again and would recommend to friends. We booked for 7pm and arrived on time. The table was ready and we sat straight down, our order was taken for drinks and food within 5 minutes, so far very good. The drinks arrived within a couple of minutes though the water was missing. The Bruschetta arrived some 10 minutes later and had obviously been prepared much earlier as the bread base was wet indeed soggy. After a further 35 minutes we were still sat with the empty plates in front of us, drinks drunk and still no water. Other tables were being served. After 50 minutes we decided enough was enough, with no sign of the main course we decided to leave. On the way out we were approached by one of the managers who apologised and took our email address to followup our complaint about poor service and food. We have not had any email from him or Dukes92. I have to say that we eat regularly at Dukes and have held a birthday party for over 80 people when the food and service was excellent. I sincerely hope that this was a one off and that normal service can be resumed. Excellent service, food and atmosphere. Always a really good experience. Consistently brilliant restaurant. Great atmosphere and superb location on the outskirts of the city making it easy to arrive and park. Staff are very good without being fussy and always smiling. The bar and music were great, but booked a table for 8.30 on a Friday evening for 2, no sirloin steaks? Ordered the fillet steak instead which was very over cooked and service was poor, will go for drinks but not for food again. Lovely atmosphere- especially enjoyed the mother board and half price champagne. Quality customer experience, great proactive service & menu was perfect. The meal was delicious and the service was very good, there was no rushing required and the staff were polite and happy. Me and my partner dine here to celebrate our new apartment in Manchester after moving from Preston. 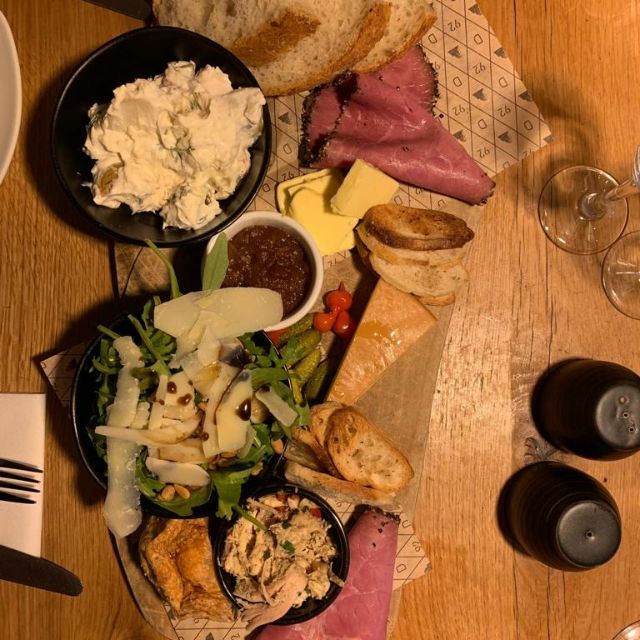 The food was really nice, I had a fillet which was good and my partner had the sharing board with few different types of cheese and I have to say that was amazing! I wish I had that one too! The selection was great and they were really tasty! Good food, some interesting choices on the menu which was nice! The atmosphere is good for after work, quite smart and formal. The booth areas made is more cosy. The service: the waiters were nice when they were with us, but they were slow. We saw them several times stood around chatting when we needed the bill etc. Absolutely outstanding, from walking through the door the service was excellent, having a partener that is highly allergic to nuts, the manager was very patient and understadning of this and pulled out all the stops to ensure no nuts could get into or where in her meal. He ran us through the full allergen menu, advising us of what food/meals to avoid ordering. Then when the food came, the server was brilliant, and the quailty, presentstion and flavour of the dishes where amazing. I have drank in Dukes92 a couple of times before but never eaten and this was well worth the visit and was great value for money especially for the service we received.